The R. J. Mitchell Wind Tunnel is the largest of the University's three wind tunnels. It is an extensively equipped low-speed wind tunnel with a 3.6m x 2.5m working section, with moving ground and a maximum wind speed of 40m/s. It is ideally suited for vehicle aerodynamic work and performance sport testing. As an Enterprise unit a wide variety of projects can be carried out, involving the combination of consultancy and wind tunnel tests where required. The University of Southampton’s R J Mitchell Wind Tunnel has been at the forefront of aerodynamic research for more than 30 years. Donated to the University in the 1980’s, the R J Mitchell Wind Tunnel was originally built and used at the Royal Aircraft Establishment in the 1920s. Over the years the wind tunnel has been used extensively by industries including motorsport, automotive, aerospace, marine, maritime and performance sport. Research carried out at the R J Mitchell Wind Tunnel has assisted the British cycling team as well as others, in their preparations for the London 2012 Olympics. This was part of the sports related research in the faculty which received the prestigious Queen’s Anniversary Prize for higher and further education in February 2012, for innovation and world-leading expertise in performance sports engineering. Today the R J Mitchell Wind Tunnel serves many purposes including commercial testing, research and teaching. They are used frequently by Undergraduate, MSc and PhD students undertaking research into areas such as yacht sail and aircraft wing aerodynamics. They also provide links to the marine industry through the Wolfson Unit which conducts maritime consultancy work for yacht, ship and power boat manufacturers. New customers to the tunnel include a leading high performance car manufacturer. Consultancy includes technical support, design and drawing, results analysis and interpretation. Our staff can work for and with customers to carry out a project efficiently and effectively. Alternatively customers can hire our tunnels and undertake tests themselves but can call upon our expertise should an unforeseen need arise. Support facilities include workshops for metalworking, model making and jig manufacture although in many instances models are manufactured by external specialists and outfitted in our workshops. 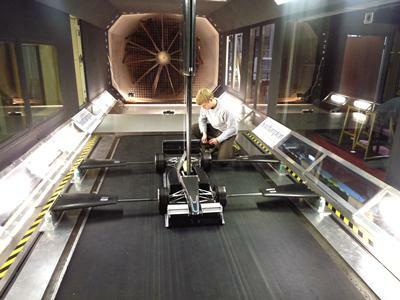 The University of Southampton R.J. Mitchell wind tunnel is operated by experienced technical staff and backed by the knowledge base of internationally recognised academic researchers in fundamental and applied aerodynamics.